The decanter centrifuge’s hour has come as soon as the solids content in the suspension to be processed is particularly high. These decanter centrifuges provide the benefits of high clarifying efficiency and maximum dewatering as well as the separation of liquids with the simultaneous removal of solids. The main requirements in this respect include a high bowl speed, a powerful drive for the scroll and a scroll speed which automatically adapts to the solids loading in the feed. 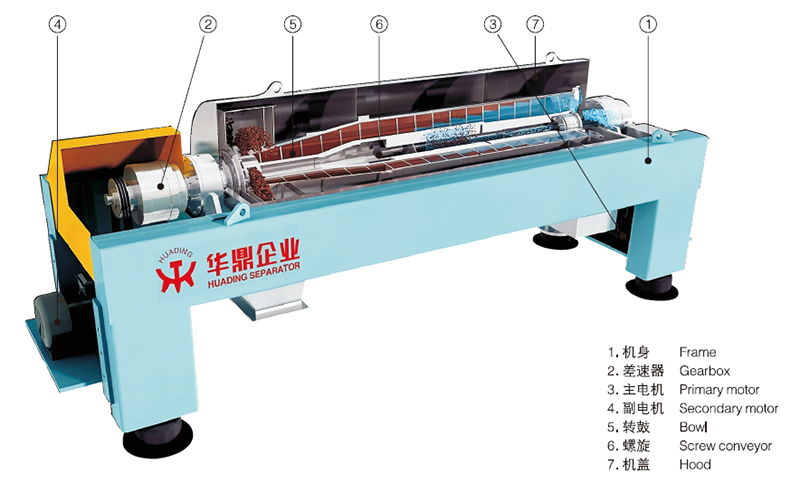 Due to its versatility and the technological know-how of Huading Separator, the decanter centrifuge can be used for a wide range of process tasks; from clarification through separation, classification, concentration and washing right up to extraction. The main components of a decanter centrifuge are the bowl, the screw conveyor, the gearbox, the frame with the casing, and the feed and the discharge arrangement. The bowl consists of four parts. A large end (or front) hub, a cylindrical section, a conical section (or extension) and a small end (or rear) hub. On the hubs are the main bearings and the bearings for the screw conveyor, the drive pulley and the gearbox adapter. The conical section has one (or two) row(s) of solids discharge openings. The discharge openings are in most cases lined with replaceable bushings or liners made from abrasion resistant material such as stellite or tungsten carbide material. The large end hub has four or more liquid discharge openings. Some types have pressurised liquid discharge by means of a paring disc (centripetal pump) placed outside the large end hub. The bowl is driven by an electrical motor, via V-belts and pulleys. forward inclination (canted flights). The conveyor flights are normally protected against wear by means of an abrasion resistant material such as stellite, wear resistant alloys or sintered tungsten carbide tiles. The feed slurry is introduced into the decanter through feed openings in the conveyor body. The gearbox is fitted on one of the end hubs of the bowl and drives the conveyor by means of a drive shaft through the bowl end hub. The differential speed is determined by the speed of the input shaft (sunwheel shaft or pinion shaft). The gearbox is of a planetary or cycloidal type. A conveyor driven by a planetary gearbox turns slightly slower than the bowl. There are various designs of frame and hood. The frame/hood is a welded stainless steel structure carrying the rotating parts and resting on vibration isolators. On newer types the main drive motor as well as the back-drive system is mounted on the frame. The lower part of the hood is integrated in the frame in the newer types whereas it is a separate part in older types. The upper part of the casing (the cover) is always a separate part. The casing is a stainless-steel structure collecting the separated liquid and solids and having means for connections for further transport of the separated liquid and solids. The main drive is an electrical motor driving the bowl through V-belts. For the regulation of the speed of the sunwheel shaft on the gearbox, a number of different systems (back drives), mechanical, electrical and hydraulic, are used.